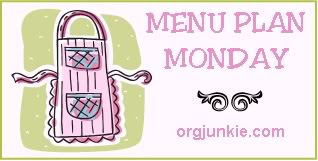 I recently began participating in Menu Planning Mondays at I'm an Organizing Junkie. I've been informally menu planning for years. It was crucial when I was a full-time working away from home momma. I had grand ideas when I dreamed of staying home that I would be able to concoct these fancy gourmet meals and I would have hours to prepare tasty, interesting meals! Well, here's a reality check for me, the more you're home the more messes you make and thus the less time you really do have! Yeah, never thought about that in my daydreams! So I have found that menu planning is just as important when you stay home as it was 6 months ago when I worked away from home. I know a lot of you have been menu planning for along time, but for others, the concept may be brand new. What is a Menu Plan? Seems like a goofy question but really I have had friends ask me, "A menu plan? What do you mean by that?" A menu plan, simply put (no pun intended) is having a plan for several days worth of meals. How do I start a menu plan? There are lots of techniques: like having a month's worth of family favorite recipes and just rotating the same things, or making meal plans by using what you have on hand, or making a plan using what's on sale for the week at the grocery store. There's no wrong or right way to make a plan. Do what you find works best for you! A menu plan can look different for each one of us, let me explain. A menu plan to one woman could be buying for and organizing 3 meals a day for a week. Others, may just have a menu plan for dinner and plan for a month (this is what I try to do). I'm an Organzing Junkie-I know I included her link above but she really is the best place to start. She spells the menu planning process out in an easy-to-understand way. Money Saving Mom- This is probably my favorite blog because of all the great tips and tools she has on her site. The best part is she's real and doesn't pretend to have "it" all together. Make sure to also check out her video series on meal planning. Life As Mom- Jessica's speciality is freezer cooking and has lots of great tips and good recipes that make it easy. She's also in the process of writing a cookbook and she knows what she's talking about! The Happy Housewife-She's a mom of 7 kids where meal planning is a must! Need I say more? Just a Pinch Recipe Club- My new favorite recipe site. I've used All Recipes for while and still like it but this one is much more user friendly in my opinion. Happy Planning! Oh and I did originally post by menu plan in here but I removed it because of some blogger formatting issues. I can't figure it out right now so I removed it for the moment, sorry!